"...offers exquisite teas...be sure to enjoy a fragrant cup of tea by the sea." Tea By The Sea is the perfect place to enjoy lunch with an old friend. Tea By The Sea purveys renowned Harney & Sons tea also served by at The Ritz Carlton and Waldorf Astoria Hotel. - fine tea, assorted finger delights, fresh fruit cup, sherbet, tasty desserts, and tea knowledge in this quaint English tea room. Experience what the buzz is all about...Join us for tea! 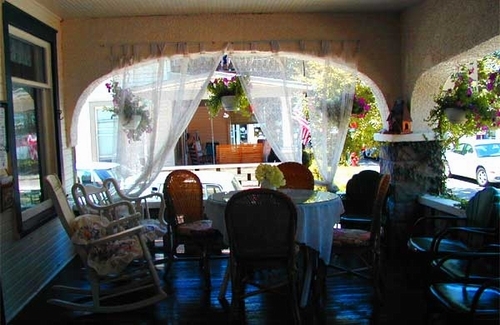 Savor an afternoon cup of tea while reading your favorite book on the front porch. Celebrate any Special Occasion with the relaxing splendor of chamber music and the wonderful culinary delights prepared daily.